Scorpio and Tata sumo vehicle battery xp800 with warranty 36 months . Contact : 04066636663. All types of Exide vehicular batteries at reasonable price. NXT Series - 3 Years Warranty Features & Benefits Deep cycle application. Fast recovery from deep discharge. Extended cycle life. Fast recharge capability. Excellent charge retention. Free from Orientation constraints. Eco-friendly. XHD Series - 5 Years Warranty Features & Benefits Tubular VRLA battery. First Of its kind. Comparison Between MF Flooded And Industial Battries. EP Series Specifications Chart. nverter Batteries INVA TUBULAR - 48 Months Warranty Exide INVA TUBULAR Range - The Ultimate Tubular batteries especially designed with Thick Tubular Plates to withstand long and frequent power interruptions. The Legendary Exide Torr Tubular Reliability now comes maintenance free from the state of the art manufacturing line. Exide launches new Powersafe XHD series with unique GEL technology mainly for UPS application. These batteries are designed with tubular positive plate and GEL Electrolyte. PRODUCT FEATURES: APPLICATIONS: Maintenance Free - No topping Up ever, UPS system Capable for deep cycling Process Instrumentation and control No acid stratification Office automation equipments Supplied factory charged- ready to use EPABX system Designed for long life Electronic attendance and Cash register Compatible to CC-CV charging Fire alarm and Security system Deep discharge protected technology Exide Power Center is trusted by generations for being a marketing expertise and largest lead battery manufacturers such as Powersafe EP VRLA Batteries, Powersafe NXT VRLA Batteries, Powersafe XHD VRLA Tubular Batteries and Powersafe UPST. 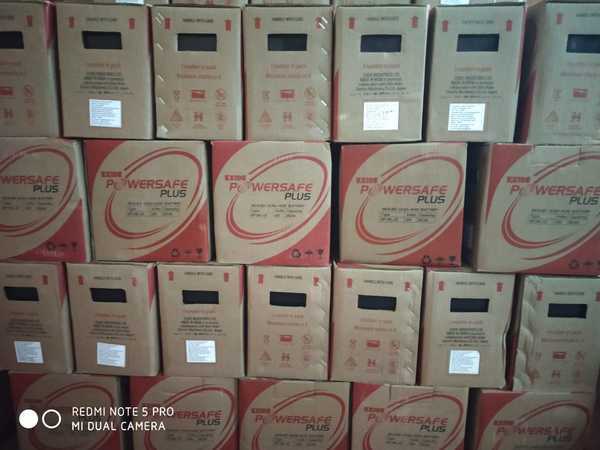 Our Powersafe EP VRLA Battery is a valve regulated lead acid battery while the Powersafe NXT VRLA Battery is a long hour running battery that comes with three years warranty. Powersafe XHD VRLA Tubular Batteries that we manufacture are well recognized for their torr tubular toughness. Powersafe UPST assures uninterrupted power supply system for telecommunication and railway signaling. The growing need for VRLA batteries has made it important for us not to lose focus in this segment. Exide has recently launched its InvaTubular GEL. This new battery range has been designed with Exide’s propriety Torr Tubular Technology range of maintenance free VRLA Tubular Gel Batteries. IT GEL is completely sealed, and no topping up is required ever in its life. If you think this is enough, there’s more. It has 20% more life than conventional flooded tubular batteries, and is housed in a DIN container with a lighter footprint. It has a gelled electrolyte, which highlights no topping up or spoilage. It also consists of an un-screw protected durable valve for pressure regulation with filter disc. This battery will be most suitable for deep cycle applications. Last but not the least, it has a long life, with a 48 month warranty.